If you have lot’s of stuff to put on your screen for a single activity, you should probably go for the SlidingDrawer widget. It is very simple to use, and looks cute. Here are the steps that you need to do for bringing up the sliding drawer on your activity. 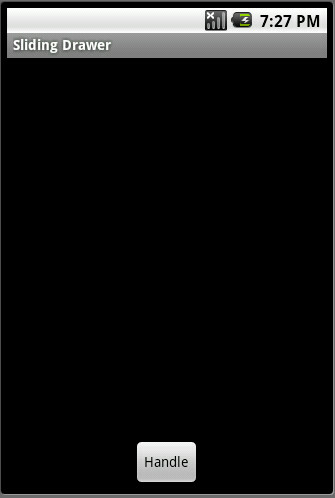 Here is a sample application displaying how to code up a sliding drawer. It’s pretty simple, and I don’t think it needs more explanation. The sample project sets up a Sliding Drawer at the bottom of the screen. You can change it to appear at place of the screen. You just need to change/adjust some properties of the SlidingDrawer. There are properties like “topOffset”, “bottonOffset”, “rightOffset” and “leftOffset” with which you can position your drawer anywhere. With a few more changes, you can attach backgrounds/images to the whole SlidingDrawer. For example, I have added a color background to the content of the Sliding Drawer. Update: Here is the link to the source code which shows how to cook up a simple sliding drawer. Doesn't this work?? As far as I can remember, this example shows the drawer on top of all the views. Let me have a look at your code and then I can answer. i have a canvas which is drawn on the ondraw method ..
this is how i have set the two in the content view .at first the slide drawer is on the top of canvas.. when i click to make it slide it does well. but when i click on the handler to minimise it its getting hidden beneath the canvas..but its there because as i click on the bottom region, aticipating it would be there, its getting sliding in again.. any help will be appreciated.. thanks in advance.. Thanks for your easy guide! I pretty much don't know what i'm doing and I'm trying to learn java by trial and error. Where do I place the LayoutInflater code to call the drawer xml file? In the onCreate of the Activity, you can do this stuff. Thanks. I can see that it should work, but I'm getting some weird error that says 'params cannot be resolved to a variable'. Ok, I will improve this tutorial and update it with a simpler one. Will let you know when I do it. I am a bit busy now. Sorry. This covers the entire parent area and I'm looking at only having the drawer slide out just far enough to show all of it's contents. Thanks for your help. i want to get visible my custom keyboard on edittext… but it is not coming with sliding..will u plz help me. Are you using the same sample? Hmm, I think I will write up a detailed post on how to use the sliding drawer and attach the whole source code. Hi How to use SlidingDrawer for top to bottom. @Jose: Sliding drawers can be made to slide from each of the four sides. I want to open drawer from top to bottom and slow down the animation speed….how can i achieve it? Please help !!! Top to bottom, it's not possible with the default sliding drawer. I don't know yet if you can slow down the animation. Thanks for the reply bibek. I'll see to it if I can find an alternate to what I want as desired output. Is it possible to have drawers sliding out from multiple sides of the screen? As of now, by default, sliding drawers can only be made to slide out either from the bottom or the right. Multiple sliding drawers from the bottom and right should be possible to achieve. 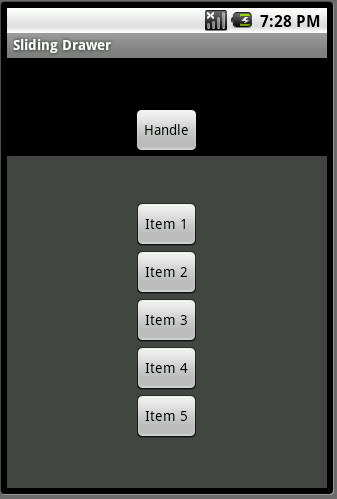 Hi Kumar, how can i use slider for other handler, means i want to handle slider using any other buttonEvent of screen. I have problem with sliding drawer!! when i open sliding drawer and click within sliding drawer area it opens image which is not part of sliding drawer but it's a part of background background screen which is gridview of image! Do you have any solution to this! Hi! I'm newbie in android development, and I need help. Your example works great but I need it to slide from top to bottom. i have a checbox beside sliding drawer handle.when i check it im going to lock the drawer,at the same time checkbox also gets locked i'm unable to uncheck it again..please send any answers if u have..
if I want to keep the drawer open (even if the handle is tapped) but items in the list can be selected, how to do it?